There in the garden, the wild dandelion was trapped, cornered, easy prey for the gardener, who swooped down upon it and with her bare hands pulled it out of the rain-softened earth. She was delighted at her kill, how long the root was! Ah, sweet victory! She flung the dandelion to the sidewalk to bake unprotected in the late afternoon sun. It was at least a four-pointer, measured by the number of blooms. She considered for a moment that perhaps it should be dried beneath a heavy pile of her best gardening books and then mounted on the wall for all to see how adept she was at pulling out that dandelion. But she was no fool, this dandelion-pulling gardener. She knew not to brag, for even trapped and cornered throughout her garden, she knew that not every dandelion would give up so much root so readily, bare-handed or with digging tools. She knew that the best she could do in her hunt for the mighty dandelions was to thwart each one by attempting to pull it, hoping for at least some root loss to slow it down. For she knew that for every dandelion trapped in her garden, millions of other dandelions lived unfettered in the wild, casting a thousand seeds on a single breeze, hoping to send their offspring to whatever garden was near or far. She had even heard that some gardeners attempted to domesticate dandelions, to plant them willfully and purposely in their gardens, where they would grow them to enormous sizes just to eat the leaves or make a little dandelion wine. None of that nonsense for this gardener! She considered the dandelion to be best viewed in the wild and continued her daily quest to thwart those that attempted to move in on her garden, to slow them down, wear them out by pulling them, and pulling them, and cutting off their blooms. She knew she’d never win completely, that the dandelions would always return from their roots or be replaced by tiny seedlings. Great post, made me chuckle. I find putting a flat stone or paving slab on the larger ones, will over time kill them. Useful where it is impossible to dig very deep. One of the most beautiful sights my last trip to Seattle was a front yard completely covered with them. It was all abuzz with bees, a moving pallet of monochromatic yellow. Job well done Carol! I am with you 100% on these weeds. In early spring, I find I can do double duty: rid the garden of dandelions and gather greens for dinner. Sauteed dandelion with a bit of onion and maybe bacon is quite good. 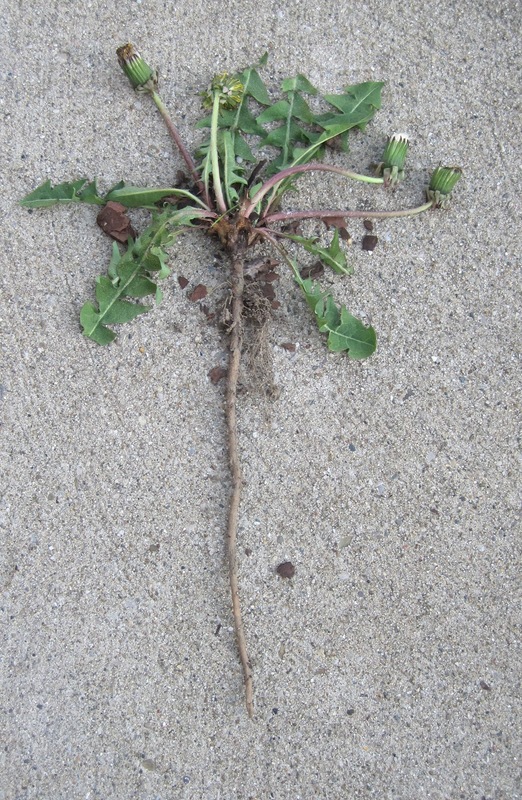 Though I do share your sense of accomplishment when getting out a whole dandelion root - I have pretty much resigned myself to the shaggy flowers in my Flowery Mead - and named my blog after this common weed. Thanks Carol for the funny fight against the mighty dandelion! My main problem is the sheer size of my yard and my kids absolute obsession with blowing those puffy little umbrellas into every nook and cranny of our property! Luckily it appears to be my chickens favorite wild green so it all seems to balance out! Your posts always make me smile! Thanks for brightening my day! That is some dandelion root--absolutely a badge of honor! I'm with Susan. While I don't plant them to eat them, the young leaves are delicious in everything from sandwiches to lasagna. Plus, they're a nutritional powerhouse and a great liver nourisher. As you might guess, the more we've learned to love cooking with them, the less they're hanging around long enough to go to seed. Good for you Carol. I definitely think you should mount your kill for others to see. Happy hunting. I recently saw hundreds of dandelions along a long country drive and they looked really lovely in flower.However I'm I battle with them in my garden! I would feel a sense of accomplishment if I ever got that much root out. Great job! My husband goes around with his digger, and does a good job keeping them out of the yard. I have been pulling them by hand out of my flower beds, with the idea you have, of weakening them until they give up. I've managed to keep bindweed under control that way. Some of these bloggers have made me think about trying to pick enough to cook something with. I have been munching on them as I pick them, though. Oh, Carol, that was VERY funny! I think you need to make a plaque for display in your garden: "Seventy in one Day!" or something like that. Thanks for the fun! My next door neighbor raised them. Ate them too. What a crop she had. What a fun post! I really enjoyed reading it. and that is one dandy dandelion you found there. Happy bloom day Carol! Love those tulips. Boy, I almost didn't make it this month but here I am. Thanks so much for hosting -- how do you do it so reliably? I'm impressed. It is so nice to feel victorious, if just for a short while, over the weeds! You might find it amusing.